Although the authenticity of the traditional sushi bar and menu is lacking, I had no complaints about the freshness of the sashimi. 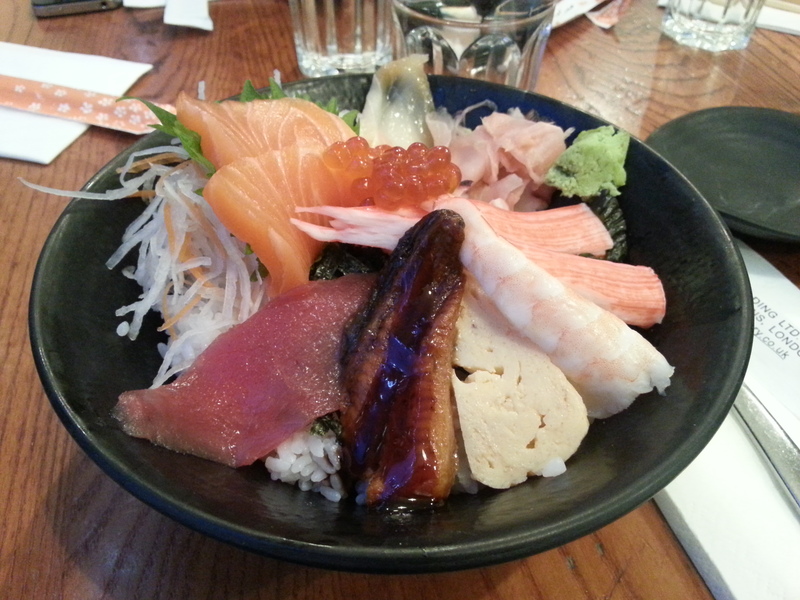 My order was the Chirashi Don, traditionally called Chirashizushi, which literally means “Scattered Sushi”. It consisted of slices of mixed raw fish (salmon, tuna, tako [octopus], ebi [prawn], white tuna, ikura [roe]) eel, omelette and crab stick with Japanese pickle, ginger and seaweed on sushi rice. The salmon and tuna had the expected melt-in-the-mouth texture of raw fish, but the tako and ebi were overcooked and too chewy. Eel (unagi) is usually my favourite sushi choice but here the teriyaki sauce was overpoweringly sweet, which was also true of the omelette, which did not taste of egg at all. And crab sticks? Are they even made of crab? I suspect this is to suit the Western palate, but my favourite part of the dish was the roe, which gave small bursts of saltiness with every mouthful. At £10.10, I was pleased with the variation of ingredients in my bowl, and overall, the dish was well presented. However, London needs more traditional sushi bars where customers can actually witness the skills of a sushi chef, rather than being served preprepared ingredients.